These raw almond butter cups are decadent, rich, with a nice contrast of dark chocolate and sweet almond butter filling. They are like a perfection in a cup form. I would say that I have a pretty strong willpower, especially when it comes to food. However, I could not stop myself from eating these raw almond butter cups. Somehow, chocolate and nut butter together are even more magnificent than they are when eaten solo. You know why? 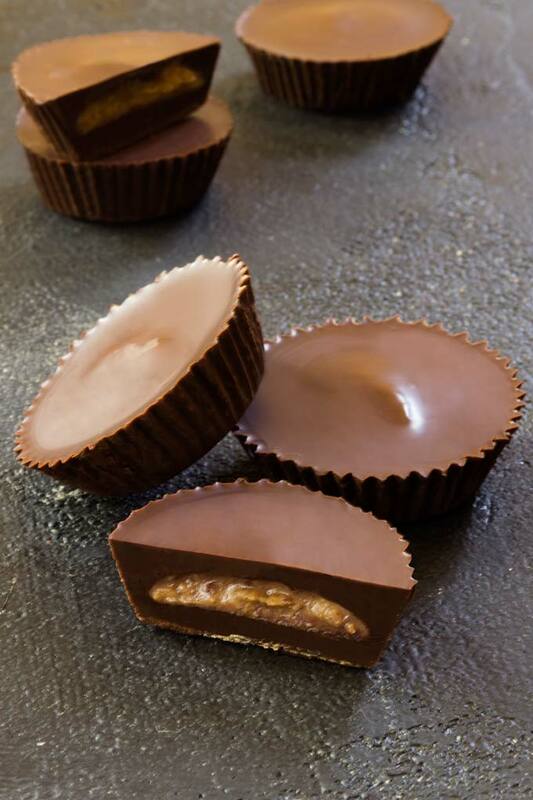 According to a study from Penn State University professor Gregory Ziegler, the reason we can’t put those Reese’s Peanut Butter Cups down is a phenomenon called “dynamic sensory contrast”, he mentions in an interview with Mic. Our taste buds love contrasting textures. When it comes to the snappy chocolate and the smooth nut butter, the two are essentially a texture power couple. So, you can thank dynamic sensory contrast the next time you devour a dozen peanut butter cups in one sitting. It doesn’t stop there though. Apart from texture, nuts and chocolate are complementary because they produce flavors that have a unique pull to people,” Ziegler says. The rich, tantalizing taste of chocolate and the nutty taste of almond butter provide the exact sensation our taste buds crave. The salt in the nuts also provides an attractive contrast to the sweet chocolate. Now, I totally understand why Reese’s Peanut Butter Cups are so popular. Perfect peanut butter to chocolate ratio. But any time I would bite into one of these, I would think “the chocolate could be darker and the peanut butter could be creamier”. I don’t think I would have said the same thing a few years ago. But as I have gotten older, my taste buds have become more ‘mature’. 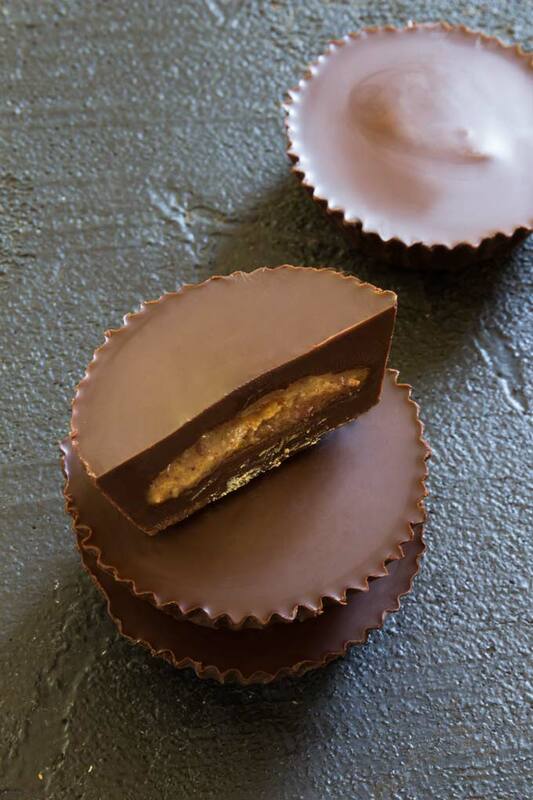 So here is a healthy twist on everyone’s favorite Reese’s Peanut Butter Cup – the almond butter cup with dark chocolate and creamy almond butter filling. 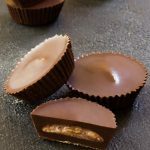 Depending on whether you’re making your own raw tempered chocolate from scratch or just simple raw (untempered) chocolate, you could have these almond butter cups done in minutes. Since I have written an entire guide to tempering chocolate, I will focus on the untempered chocolate here. The most common ingredients for raw (untempered) chocolate are coconut oil, cacao powder, and maple syrup. This is at least what I have seen on the internet. I have also seen a lot of comments below those recipes along these lines: “the cacao butter separates from the maple syrup”, “the maple syrup sinks to the bottom and the top is devoid of sweetness, “there is an oily layer on top of the chocolate”. The reason this happens is that coconut oil doesn’t mix with liquid sweeteners. As soon as you stop stirring the chocolate mixture, the maple syrup (or any other liquid sweetener) sinks to the bottom. It’s the exact same principle that applies to mixing water and oil (the two don’t mix together; oil floats on top of water). So what I recommend – even with untempered chocolate – is using powdered coconut sugar in place of a liquid sweetener. The only reason I got away with using a liquid sweetener in these raw brownies, is that the chocolate layer on top was very thin. So when I placed the brownies into the freezer, it set very quickly, before it had time to separate. For fat, I went with cacao butter as opposed to coconut oil. It only makes sense that two elements from the same plant mesh better than two unrelated ones. Cacao butter also melts at higher temperatures than coconut oil. Since this chocolate is untempered, it will still melt at a room temperature, but not as quickly as if you added coconut oil. The only disadvantage to using cacao butter is the price. Cacao butter is generally more expensive than coconut oil. So if that’s a concern, just go with coconut oil. Finally, cacao powder. I tested this chocolate with both raw cacao and cocoa powder and both of them are delicious! The raw cacao tastes a bit more bitter, but win in health benefits. So go with cocoa powder for a better taste or cacao powder for more nutrients. Same as with the chocolate, you don’t want to sweeten the almond butter (fat-based) with a liquid sweetener (water-based). In this case, the almond butter has a much higher viscosity than cacao butter (or coconut oil) so separation wouldn’t be a problem. The almond butter would hold on to the sweetener. However, the two would still not mix well. Same as with the homemade Nutella recipe, the nut butter-liquid sweetener mixture would ‘seize up’. So again, I would highly recommend using a powdered sweetener, such as finely ground coconut sugar. Both the chocolate (unless you’re making tempered chocolate) and the almond butter filling are really quick and easy. Combine and mix until smooth. Just make sure that you grind the coconut sugar very finely. The sugar won’t dissolve in cacao butter/coconut oil/almond butter. So for smooth chocolate and creamy almond butter filling, grind the coconut sugar in a blender or a coffee grinder into a very fine powder. You might even want to sift it. You can make these almond butter cups in silicone mini muffin holders or just line a regular mini muffin pan with cupcake liners. The liners will make it easy to remove the almond butter cups from the pan. Line a mini muffin pan with paper liners. Grind the coconut sugar into a very fine powder. A coffee grinder or a high-speed blender work the best for this. Sift the coconut sugar. Prepare the almond butter filling: combine the powdered coconut sugar with almond butter. Stir until completely smooth. Prepare the chocolate: place the cacao butter shavings into a stainless-steel saucepan and melt it over a very low heat. You could also set up a double-broiler (bain marie) by placing a clean bowl over a saucepan of hot water. Just make sure absolutely no water get inside the bowl. This applies to steam as well so don't keep the water boiling! When about 50% of the cacao butter is melted, take it off the heat and let the residual heat of the saucepan/bowl to melt the rest of the cacao butter. Once melted, add the cacao powder and powdered coconut sugar. Stir it thoroughly with a balloon whisk or fork, until it starts to slightly thicken. Carefully spoon about 1 tsp. (5 ml) of chocolate into the cupcake liners and let it set. Then drop 1 tsp. (~5 g) of almond butter filling into the center of each cup. If the almond butter is sticking up, gently press it down so each cup has a smooth top layer. Just be careful that the filling doesn't get all the way to the sides of the cupcake liners. There should still be some room for chocolate. Divide the remaining chocolate among the almond butter cups, about 2-3 tsp. (10-15 ml) per cup. Freeze for one hour or until solid. 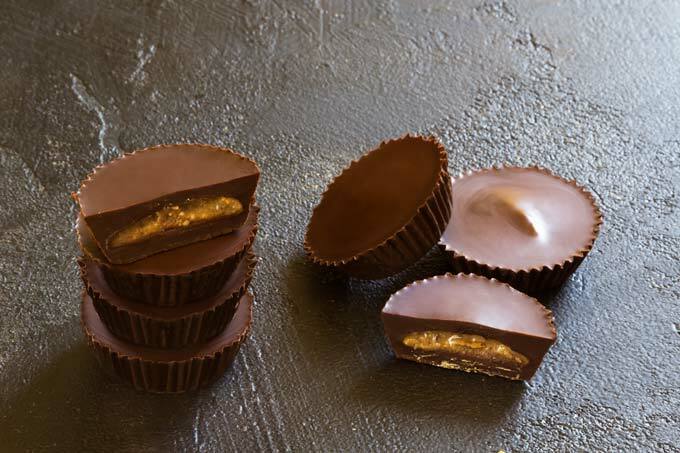 Store leftover almond butter cups covered in the refrigerator for up to 1 week. For longer term storage, freeze in an airtight container for 1-2 months. Thank you so much, Angelina. I am so happy you’re enjoying the recipes ❤. To be honest, I am not sure. There are many online apps for counting calories if you’re interested. One of the most popular ones are SparkPeople, FatSecret, or Lose It! Please, let me know if you have any questions. Can I replace the coconut sugar with honey?how much would I put? Also how about the coconut oil, what quantity? Hi Ana – I wouldn’t use honey because it is a liquid sweetener (just like maple syrup or agave). You could, however, use any powdered sweetener you like. (It doesn’t have to be coconut sugar). That being said, you might get away with using honey if you put the chocolate into the freezer immediately after pouring the chocolate into the cupcake liners. If the chocolate hardens before the sweetener has time to sink, it will work. I just wouldn’t take the chances. The amount of coconut oil would be the same as the amount of cacao butter. Please, let me know if you have any other questions. I just made the almond butter but there seems to be no oil in the mixture. I used soaked, blanched and dehydrated almonds. I didn’t roast them at all. Would the oil have come out if they had been roasted first? I have a thick almond butter but absolutely no oil in the mixture or maybe say a drop. It is after all a butter (which took me almost an hour in my medium strong food processor). Should I add my own oil (thinking grapeseed oil) and keep it in the fridge. Two weeks ago I made Hazelnut butter (with roasted nuts) and the oil is separating from the butter and has to be blended in. Or, should I just use the mixture as is or lightly roast the mixture to perhaps bring out the oils more? P.S. I made your flaxseed wraps on Friday but only used one and put the other unrolled servings in the fridge. Today I made another one. Friday’s was very good. My question is: The extras that were in the fridge do they have to be moistened further before rolling out and cooked? Hi Linda – I just added the imperial measurements. I totally missed it. Thank you for catching that! I made these yesterday and they turned out fantastic! I went to culinary school and tempering chocolate was something I failed at all the time haha, so I just used Belgian chocolate wafers (non-dairy). I also topped them off with flaked sea salt. Thank you Petra! would i be be to make these in regular muffin size liners? I don’t have mini pan or liners.